From the girl who loves this holiday above all the rest! 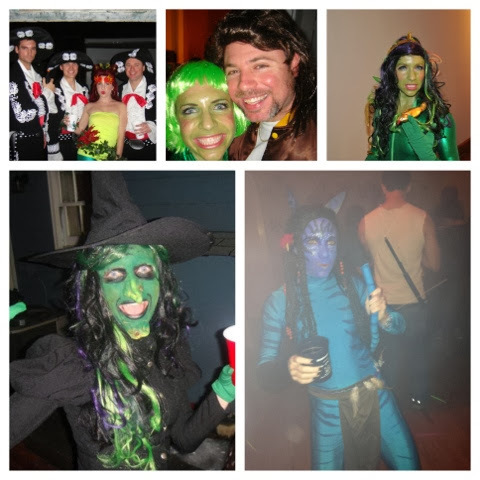 I have an affinity for green costumes..Over the last 5 years I have dressed up as: Poison Ivy, an Alien, Medusa, the Wicked Witch and Neytiri from Avatar. Neytiri and the Witch were my fave! I did my big dressing up this past weekend. Tonight I will be donning some Minnie Mouse ears and handing out candy to our crowd of trick-or-treaters. I live right next to the street that EVERYONE goes to on Halloween. Every town has THAT street. You know the one where someone gives out regular sized Snickers and go all out on decorations. Well East Capitol is THAT street for the DC area.It has a wide road with lots of row mansions houses on either side of it, and it has a gorgeous view of the Capitol. People park in my neighborhood and then use Alycyn and my house as a tune up before the candy overload on East Capitol Street. We get a large amount of candy hunters as a result of living in such close proximity, and I love it.